Mr. Dudley lost his License for the House I now occupy, about twelve months ago, in consequence of its having been kept in the most abandoned manner, and being the resort of the most profligate. I then kept a Licensed House on the Sand Hills; the proposition was made to me to remove my License to Mr. Dudley’s House. I originally offered to purchase his interest in the Lease, and proposed giving him £300 for the same ; that, however, was declined, and ultimately I (foolishly I must say) agreed to take possession, by allowing him to take one-half of the profits,— and a memorandum to that effect was ultimately drawn up by Mr. Brean, my agreeing to pay in cash one-half of the value of certain articles of furniture, billiard-table, &c. prior, however, to my taking possession, I stipulated, that Mrs. Dudley end family should be removed, so that I might re-model the House upon different principles to which it had hitherto been conducted. From Patrick Walsh, Sir George Arther Inn, Sandhill, to Mr. Thomas Archer. 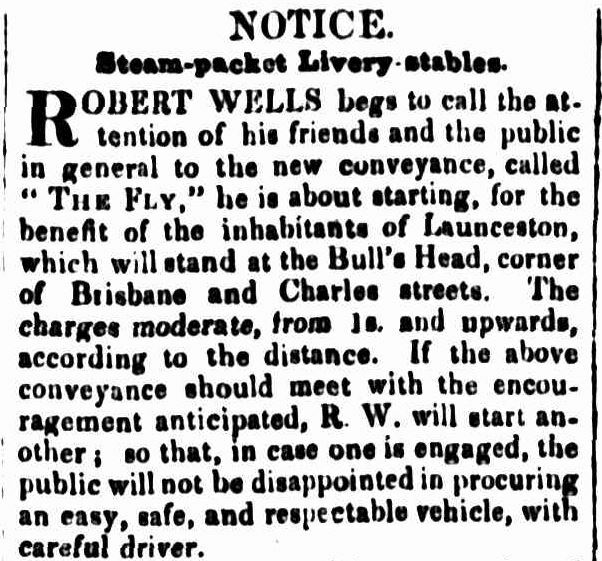 From Mr. Thomas Dudley, Black Swan, Wellington and Brisbane-streets, to Mr. James Childs. 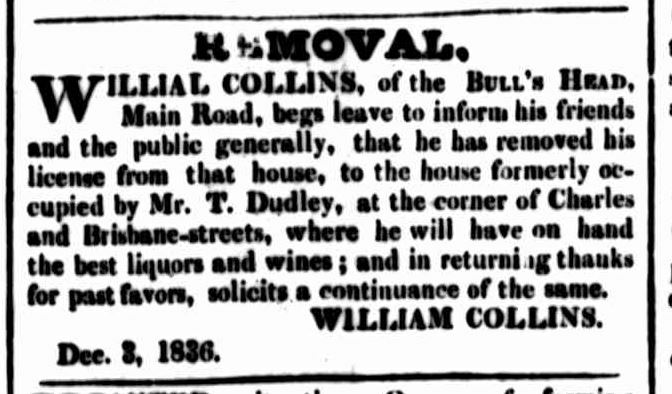 From the executors of Mr. Collins, Bull’s Head, Charles-street, to Mr. William Duncan. 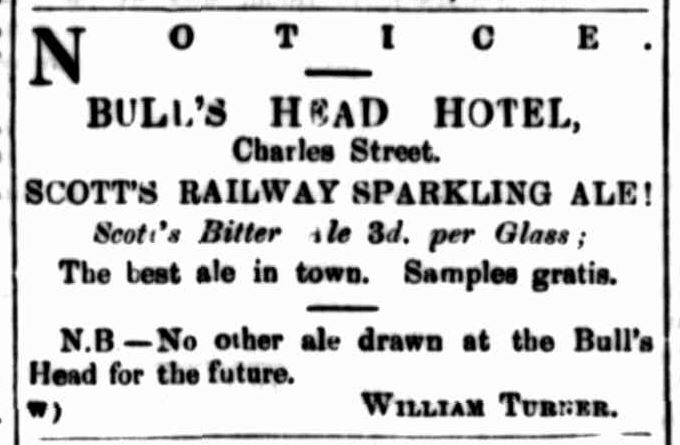 A new license was granted to Mr. James Whitehead, late of the Eagle’s Return, Snake Banks, for the Cornwall Hotel, Cameron-street. Wm. Duncan, ” Bull’s Head,”. corner of Charles and Brisbane streets. No conviction ; general conduct good ; house inferior, but clean and in good order, Granted. 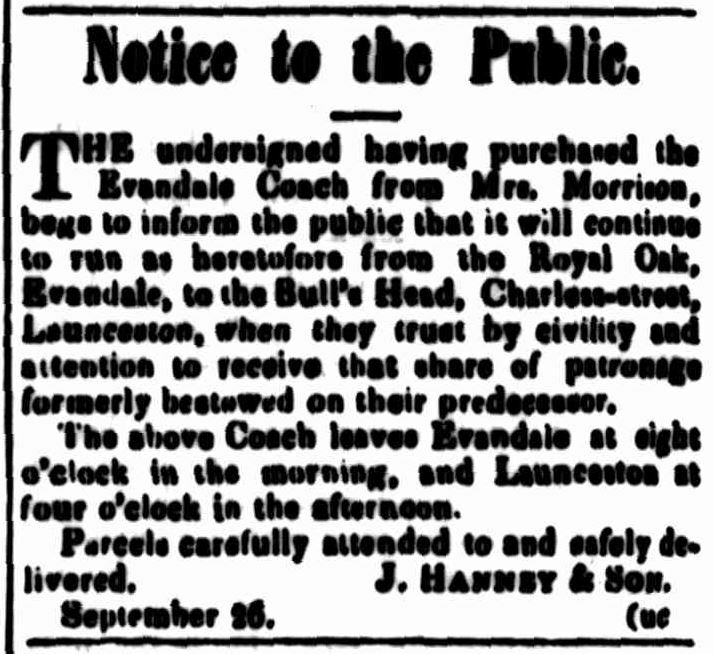 FIRE.—Another destructive fire occurred last night in Launceston, by which the public-house at the corner of Charles and Brisbane-streets, known as the “Bull’s Head,” kept by Mr. W. Duncan, was entirely consumed. The fire originated about half-past eleven o’clock, amongst some straw in an out-building, and the flames instantly took hold of the kitchen attached to the house of Mr. W. B. Button, grocer. Here the fire was arrested by copious supplies of water thrown upon the roof end sides, but from the nature of the buildings a clean sweep of the entire block was anticipated, and several shops were accordingly stripped of their goods, However, by great exertion, the conflagration was confined to the Bull’s Head,” which in the course of a few hours was level with the ground. A detachment of the XI. Regiment, under the personal command of Major Harrold and Captain Thornton, as well as the police magistrate and a strong body of constabulary, were promptly on the ground, and maintained order amongst the vast crowd assembled. Mr. Button (who has been in business only two months) suffers severely from this distressing circumstance, for although his shop escaped total destruction by fire, yet many perishable articles have been entirely spoiled by being exposed to wet ; in fact, the gutter was streaming with blacking and sauces which had been thrown into the street to preserve them from the fire! Three engines were on the spot, but were frequently rendered useless by the absence of water ; when, however, the shouts of the people announced a supply, and the pumps were set to work, the flames temporarily subsided. By means of a grapple and chain the brick-togged walls were pulled down upon the burning mass, which was thus, in many places, smothered. 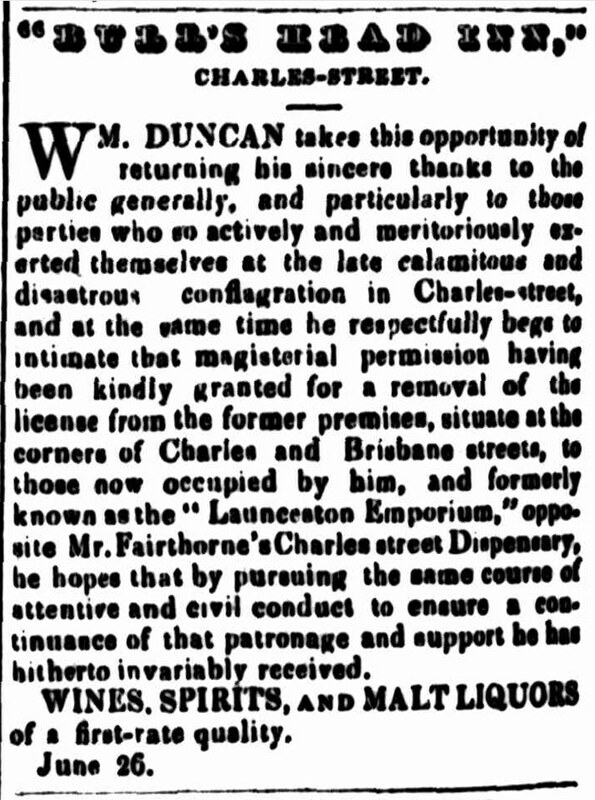 It was gratifying to observe the strong desire to render assistance manifested by all present, but a feeling of disapprobation was expressed when a few individuals, who bad partaken too freely of Mr. Duncan’s case-bottle gin, made a demand for pecuniary reward. Mr. Button was uninsured; but, fortunately, Mr. Duncan holds a policy covering his stock and furniture. 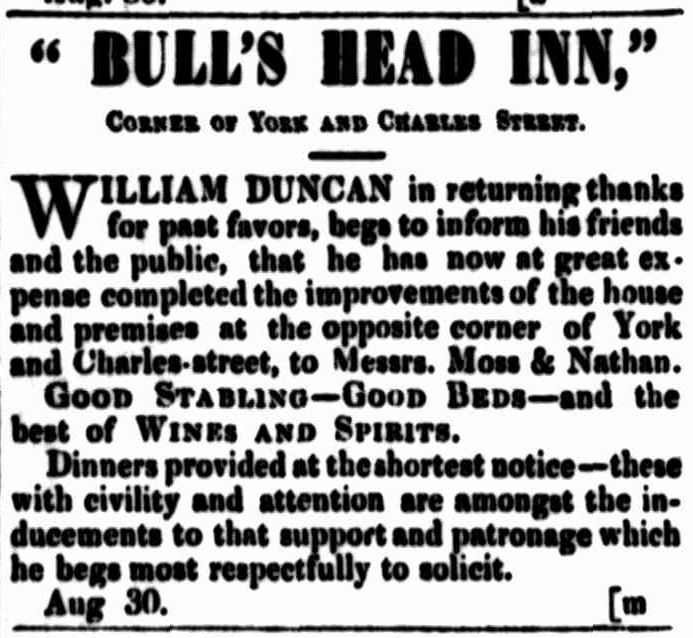 The first application was to transfer the “Bull’s Head Inn” from William Duncan, senr., to Alexander Duncan, his son. Mir. Miller, who appeared to support the application, read a very complimentary letter addressed to Mr A. Duncan, by Mr. Lowe, the auctioneer, in whose offices he had been for five years. Mr. Miller observed that the only possible objection against the transfer of tile license would be the age of the proposed holder of it. He would, however, be of age in two months, and in the meantime would have the assistance of his father, and after that of an elder brother and his wife. The Police Magistrate said he must oppose the application on public grounds. He thought so young a person ought not to have been brought forward as the holder of a public-house license; he was surprised indeed, that it should be so. He was not of age, and in his opinion not competent to manage the house, which was frequented from its position by characters difficult to deal with. Mir. Miller urged that the law mode no stipulation as to age: besides, it was well known the natives were unusually precocious,-and, besides, in this case the applicant would have the assistance of an elder brother. The chairman said the magistrates could not well take that into consideration. The question was rather–was the younger Duncan, being of good character–disqualified by his age from having the house ? Mr. Sams said the best guarantee of the fitness of the younger Duncan was the fact that his father was willing to allow him to take charge of his business. He was of opinion that unless the magistrates knew of something wrong against the son, they could not dare to refuse the application. It would be a monstrous interference with the interests of a family. 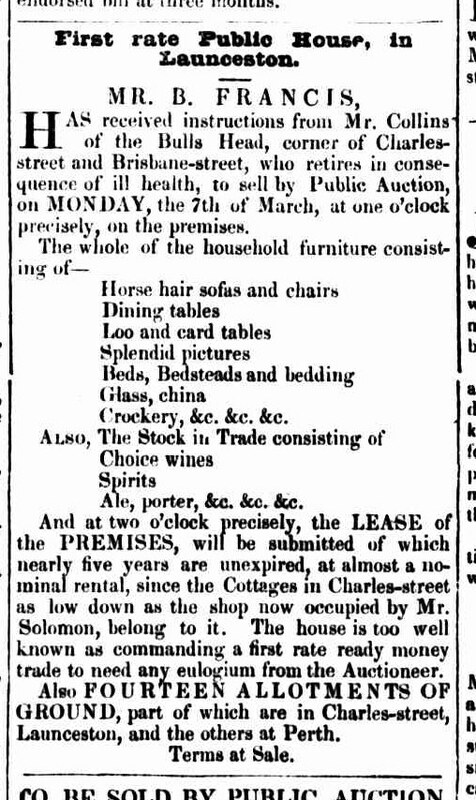 In reply to the chairman, Mr. Duncan, sen., said Io held a lease of the premises, and had hire years to run. Commander Drew said he did not see that there would be anything monstrous in refusing the application, if the Bench were of opinion that the proposed holder of the license was too young. At tile same time, under the circumstances of this case, he should not like to vote against the application. 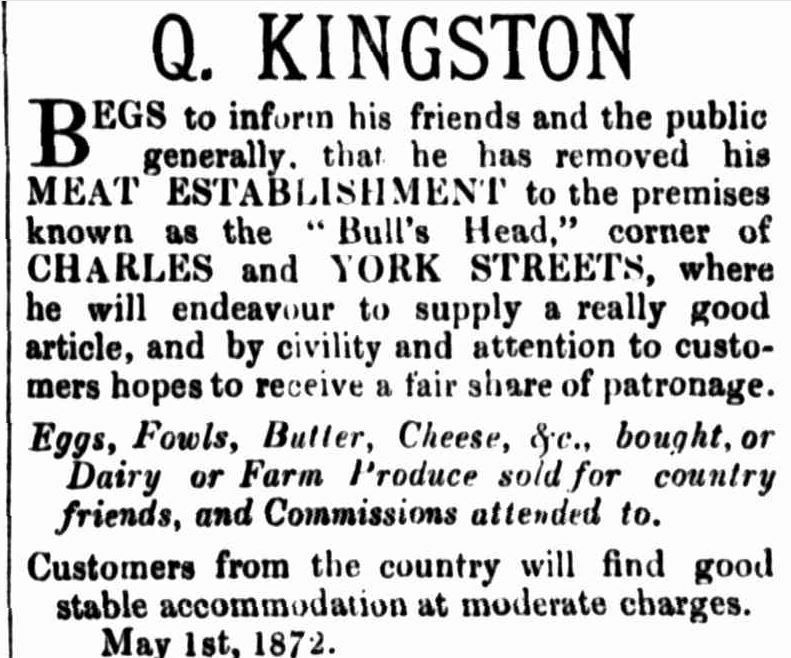 John Barnes Thompson, for transfer of license of the “Bull’s head,” York-street, occupied by Alexander Duncan. 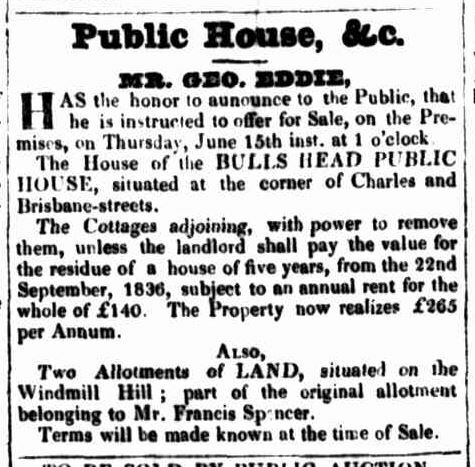 Music in Public Houses.-William Turner, landlord of the Bull’s Head, and Patrick Rice of the George Inn, were each fined 5s, and 7s 6d costs, for permitting music in the bars of their licensed houses. 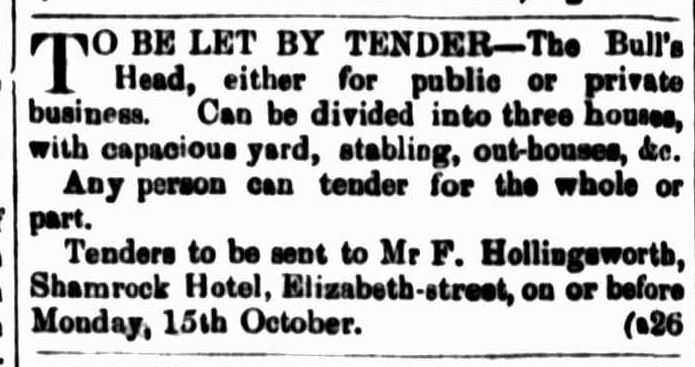 Bull’s Head Inn.— On Friday, 14th inst.,at the Police Court, before Thomas Mason. 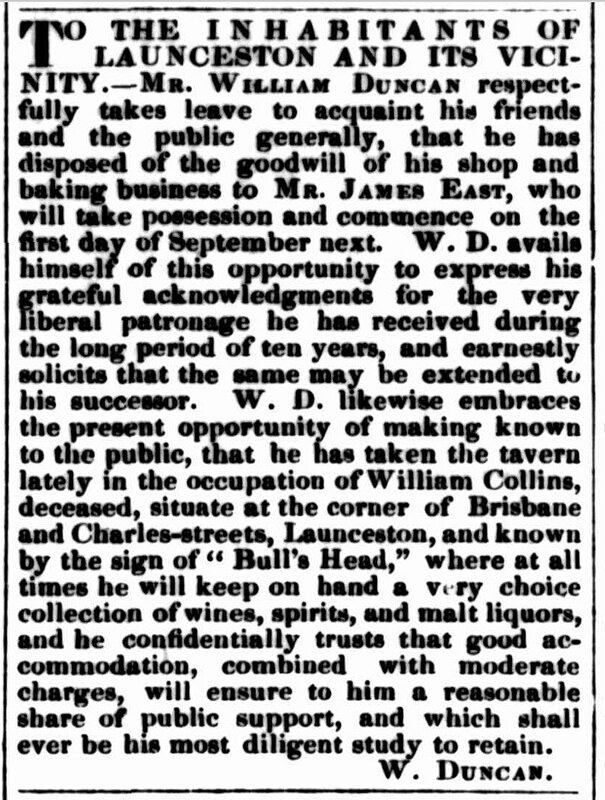 Esq., and James John Hudson, Esq., J.P., permission was granted to Mr Henry Milbanke to sell liquors under the license, granted to Mr William Turner for the Bull’s Head Inn, Charles and York streets. 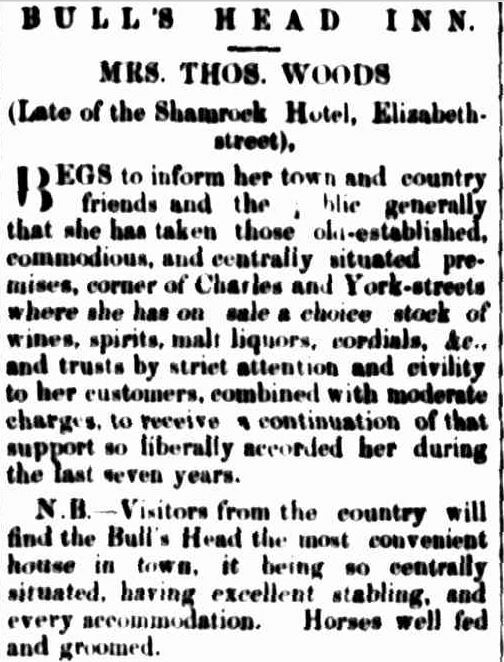 Tasmanian Inn, Bull’s Head and Shamrock Hotel.— The applications of Mr Duncan McGregor, Mrs Woods and Mr Frederick Hollingsworth for permission to sell liquors until the next quarterly licensing meeting at the Tasmanian Inn, Bull’s Head and Shamrock Hotel, respectively, under the licenses held by Mr Henry Thomas Collings, Mr Henry Milbank. and Mrs Woods, were granted by the Launceston: Police Bench, at the Police Court on Friday, 26th ult. PUBLIC HOUSES CLOSED.—The business of licensed victuallers in Launceston would appear to be on the decline, if we may judge by the number of public-houses which have been closed during the last few days. Whether our friends the total abstainers will accept this stale of things as the sign of an advance in the moral and intellectual status of the inhabitants of Launceston we cannot say; but we do not think the diminution in the number of such houses can be attributed to any extraordinary efforts lately put forth by teetotallers. 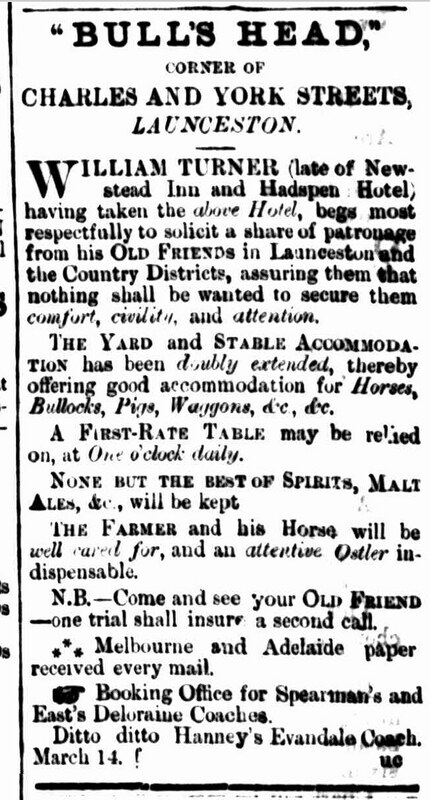 There is little doubt that there are too many public-houses of the class referred to in Launceston, and in the present depressed state of business it is no wonder that they cannot be made to pay. That they are not high-class houses is proved by their closing just now, when a better prospect is opening to respectable houses in the influx of summer visitors from the neighboring colonies. No less than four are now closed — the Bull’s Head, the Royal Mail Hotel, the Shamrock Inn, and the Albion Inn,—and others are spoken of as likely to follow. This entry was posted in Brisbane Street, Charles Street, Hotel, Sandhill, Wellington Street, York Street by Xenith. Bookmark the permalink.